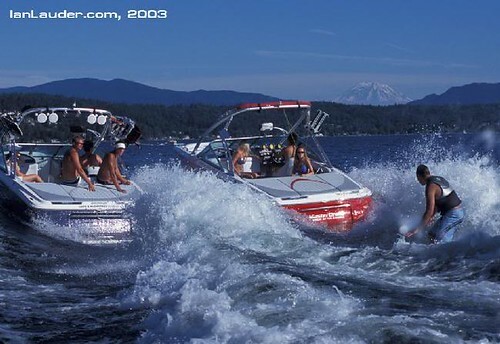 Ever Surfed a "Bowl" Behind Two Boats? Has anyone here ever run two boats to make a surf bowl? If so, any tips on maintaining speed, not swamping the boats, how to surf it, distance between boats, etc? I've seen videos, and I can't decide if it looks really fun or if it's just a washy mess. Thinking about giving this a try, so any advice would be much appreciated. its pretty fun boats need to be very close and you need to be able to surf backside so you can transfer between the waves.... the foam is kinda pointless to hangout in. On a nice long deep lake in the morning when the water is calm, I think it would be just amazing. It probably takes a little practice to get the distance just right. you're about 10ft apart from each other and obviously have your perfect pass calibrated and agreed who's adjusting speed and who doesn't … helps if both boats have a similar wave length - otherwise it's washy mess as stated above. I have not but was a driver for two different times.. tow boat starts first and second boat has to be able to be able to exceed the tow boats speed as it will join in from behind and side. boats must be real close together.. like board racks almost touching.. higher speeds will eliminate the foam wash so expect to surf at higher speeds. It was a lot tougher than I expected. Keeping the waves in perfect shape was nearly impossible. Too far apart and you can't get from one side to the other, too close and the wash gets dangerous. I was kind of bummed we weren't able to work our way around the bowl with ease, but we still had a blast trying to figure it out. I think with some practice on the part of both the drivers and the riders it could be fun, but it's a lot of trouble to set up. It's probably just as fun goofing around with transfers and other things I don't do enough like ride backside/switch foot, etc. I was really hoping there would be a way to smooth out the back of the bowl, but with two big waves coming together, the wash is frightening. It grabbed my board and twisted it so hard, I thought for a second I had broken my ankle. I was a little skittish after that. I'll bet ocean surfers get pounded like that on every run. Maybe we will try again with smaller, less steep waves to see if that helps. And I could probably maneuver the boat better without the wedge down.